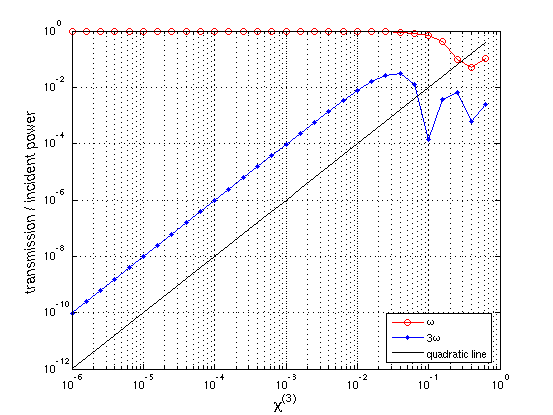 In this example, we consider wave propagation through a simple 1d nonlinear medium with a non-zero Kerr susceptibility χ. See also Materials and Units and Nonlinearity. 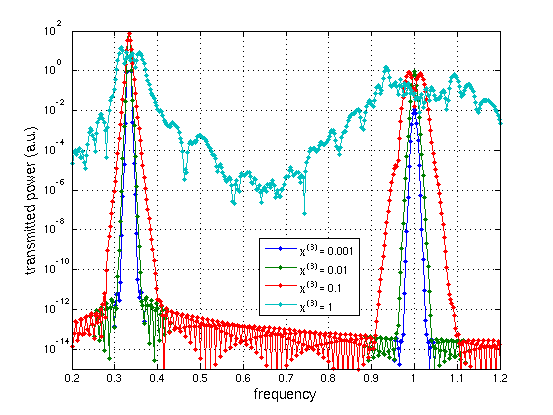 We send in a narrow-band pulse at a frequency ω, and because of the nonlinearity we also get a signal at a frequency 3ω. See also 3rd-harm-1d.py. Since this is a 1d calculation, we could implement it via a 2d cell of Vector3(S,0,0), specifying periodic boundary conditions in the direction. However, this is slightly inefficient since the periodic boundaries are implemented internally via extra "ghost pixels" in the direction. Instead, Meep has special support for 1d simulations in the direction. To use this, we must explicitly set dimensions to 1, and in that case we can only use (and ) and field components. This involves no loss of generality because of the symmetry of the problem. Note that this will only put PMLs at the boundaries. Notice how we've used the seq function to get a sequence of exponents from -6 to 0 in steps of 0.2, and how we've used the exponent as an argument to obtain a logarithmic scale.